Hello there, I did a post today on my baby registry must haves. I am currently 22 weeks and 6 days pregnant, which means my baby shower is actually exactly 2 months away. My family is sending out the baby shower invitations in the next few weeks so I have been working on my registry. I am soooo excited about some of the things that I registered. As you can tell in the picture above I went with a lot of Navy things. Chris and I like things a little more simple, not into loud colors and patterns. 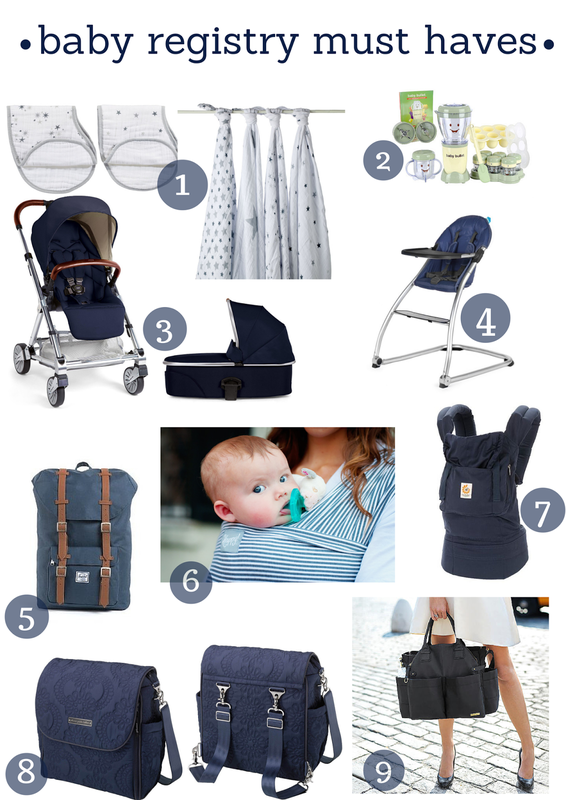 I picked my stroller first in navy and then decided to get everything else navy. I think its a great neutral color and perfect for our little boy. Here are just a few of my must haves. I’ll be sure to do another post once on more items in the future. 1. Aden and Anais: I picked these super cute burp clothes and swaddle blanks from Aden and Anais. They have tons of different patterns and colors to choose from. The swaddle blankets can be used as stroller covers, tummy time blankets, nursing covers and burp clothes. They are extremely cozy as well. I choose the Twinkle design which come with 4 swaddle blankets in the pack and the stars are grey and blue. 2. Magic Bullet Baby Bullet: One thing I decided I am going to do is make my own baby food. Which is super easy! The Magic Bullet Baby Bullet is perfect. It comes with little cup containers so you can make a quick single serving for your little one. We want to make sure our boy will be eat the best and healthiest food possible! 3. Mamas & Papas Urbo2 Stroller: I am so excited for this stroller! There were several things that were very important when picking out a stroller for us. Since we live in the city we need a stroller that is good for a city life style. This stroller is light, the front wheels have built in suspension so it is a smoother ride. It has an extra long shade to keep the light from getting in if baby is sleeping. It folds down quickly to a skinny hallway and car friendly format. Oh and did I mention it is VERY stylish. There are a ton a cute accessories that you can buy to go with the stroller as well. A bassinet which is great for the earlier months. A cold weather stroller muff which we really need since we live on the East River and it gets REALLY cold in the winters! These are just a few of the accessories you can get with this stroller. I found this is the perfect for stroller for us. 4. Babyhome Eat High Chair: Once again since we live in the city we only have a certain amount of space to work with in our home. We wanted a high chair that we could fold up easily and get out of the way when not in use. This high chair had a lot of great reviews! Fold up easily to get out of the way and it is light as well. The Tray detaches easily to be cleaned or when your baby is ready to eat at the table. The fabric is removable and can be washed. adjustable harness. Navy was a perfect color since High chairs can get quiet messy! 5. Hershel Supply Co, Backpack: Of course I picked out a few different types of diaper bags but Chris picked one out for himself. This Hershel Backpack is a perfect Diaper bag for this daddy to be! It goes perfectly with our stroller and is very roomy so daddy can carry all of the baby things that are needed. Theres no reason daddy should be carrying around mommy’s flowery diaper bag when he can have a cool - stylish backpack of his own! 6. Happy Baby Wrap: I Absolutely love these!! I knew that I wanted to get a fabric baby carrier I just wasn’t sure which one and then I came across Happy Baby Wrap! First of all they fabric are super cute and 100% Organic Bamboo Fabric. Lots of great benefits: Keeps baby cooler in the summer and warmer in the winter. UV Protection, highly absorbent and soft. Cute styles to choose from, I LOVE the slate stripe and the Polka Dot. I seriously cant wait to get these are try them out! 7. Urbo Baby Carrier: This carrier is perfect for newborn through toddler. A carrier like this has a little more support. Has a padded waist belt and padded shoulder straps which ensures baby’s weight is distributed evenly through your hips and shoulders. You can carry baby front, hip or back. Easy to use, just buckle on adjust and go! 8. Petunia Pickle Bottom Diaper Bag: I loved this diaper bag when I saw it. Not only is it Super cute and Navy but it can be used in serval different ways. As a regular off the shoulder bag, Cross body or backpack as shown in the picture above. Great for every day use! It has a change pad the rolls out. Lots of compartments for diapers, bottles and other baby necessities. 9. Chelsea Diaper Satchel: Very cute and style Black diaper bag. I wanted a diaper bag that I could use if I were to go out. Have a different option. Gold metal detailing, this diaper bag hangs over the stroller or can be hung over your shoulder. Has lots of storage, 12 compartments and can fit a laptop as well. Comes with a cushioned changing pad. Like I said these are only a few of my must haves on my registry, Ill be sure to do another post on different items.